Gato Class Submarine: Laid down, 7 April 1942, at the Electric Boat Co., Groton, CT.; Launched, 13 December 1942; Commissioned USS Muskallunge (SS-262), 15 March 1943; Decommissioned, 29 January 1947, at New London, CT.; Laid up in the Atlantic Reserve Fleet, New London; Recommissioned, 31 August 1956; Decommissioned, 18 January 1957; Transferred, on loan, under the Military Assistance Program, to Brazil, 18 January 1957, renamed Humanita (S-14); Returned to US Navy control in March 1968 and struck from the Naval Register on 1 December 1967; Final Disposition, sunk as a target 9 July 1968. Muskallunge received 5 battle stars for World War II service. 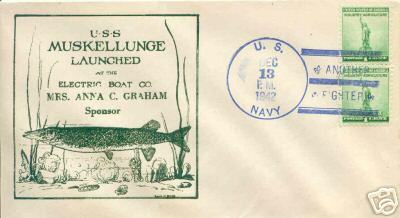 19k Commemorative post mark on the occasion of Muskallunge's (SS-262) launching at the Electric Boat Co., Groton, CT., 13 December 1942. Courtesy of Jack Treutle (of blessed memory). 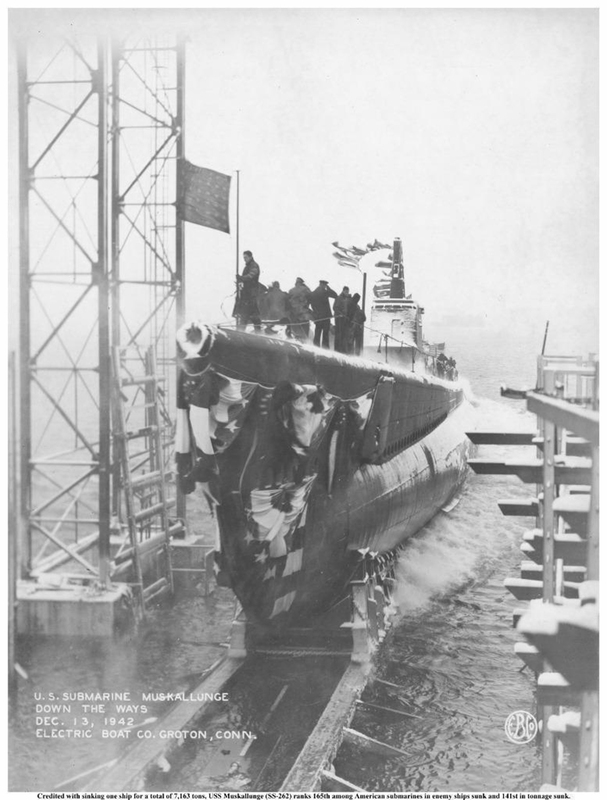 61k Sponsor's party pose for the Muskallunge's (SS-262) launching at Electric Boat Co., Groton, CT. 13 December 1942. Mr. O.F. Robinson, Anna Graham and son Arthur. Mrs. Graham was the widow of CTM Merritt Dayton Graham of the Grunion (SS-216), who was lost with the boat and 69 other crewmembers on 30 July 1942. Photo courtesy of Vickie Rodgers, grandniece of CTM Merritt Dayton Graham. 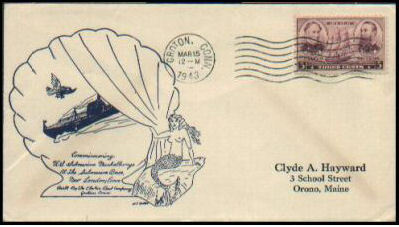 21k Commemorative post mark on the occasion of Muskallunge's (SS-262) commissioning, 15 March 1943. Courtesy of Jack Treutle (of blessed memory). 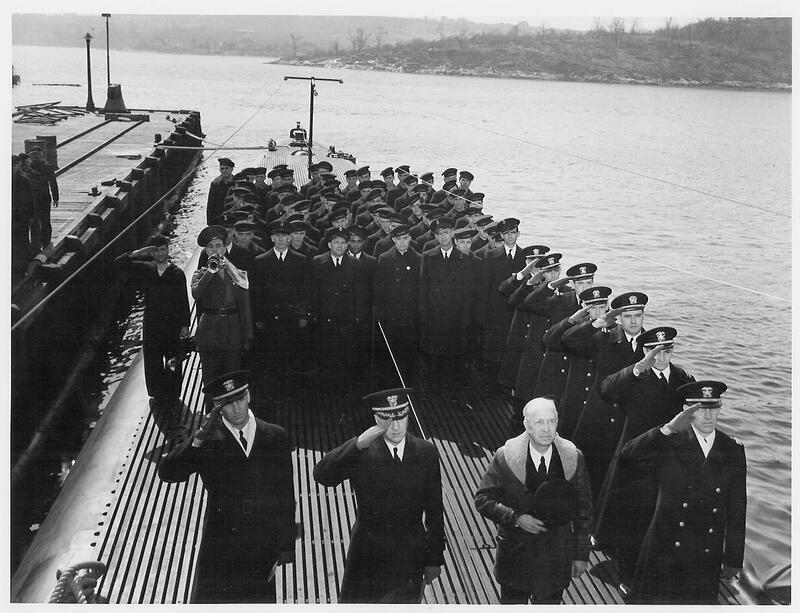 140k Officers of the Muskallunge (SS-262) pose aboard the boat during her commissioning, on 15 March 1943, Lt. Comdr. 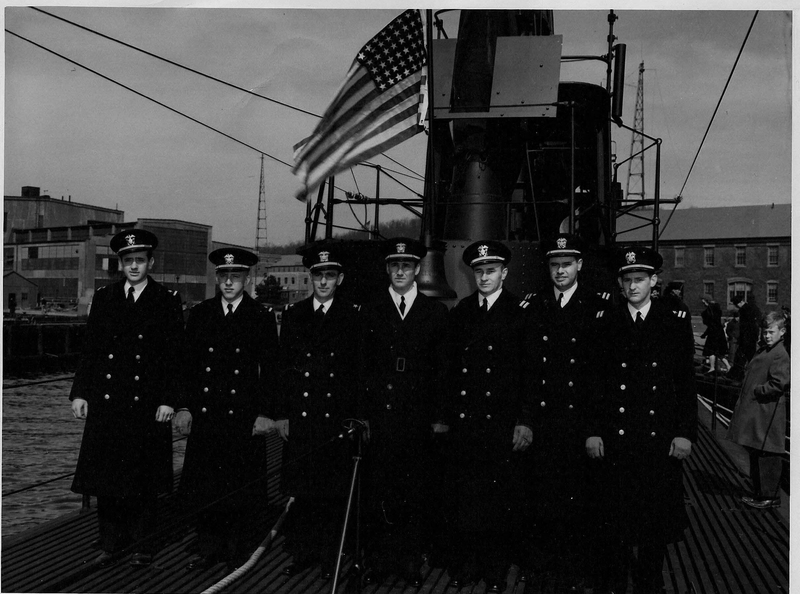 Willard A. Saunders, her commanding officer, is probably in the center. If you look past the officers head you'll see lots of either bolt heads or rivet heads on the sail by the bell. If you look one year later the sail structure is smooth . 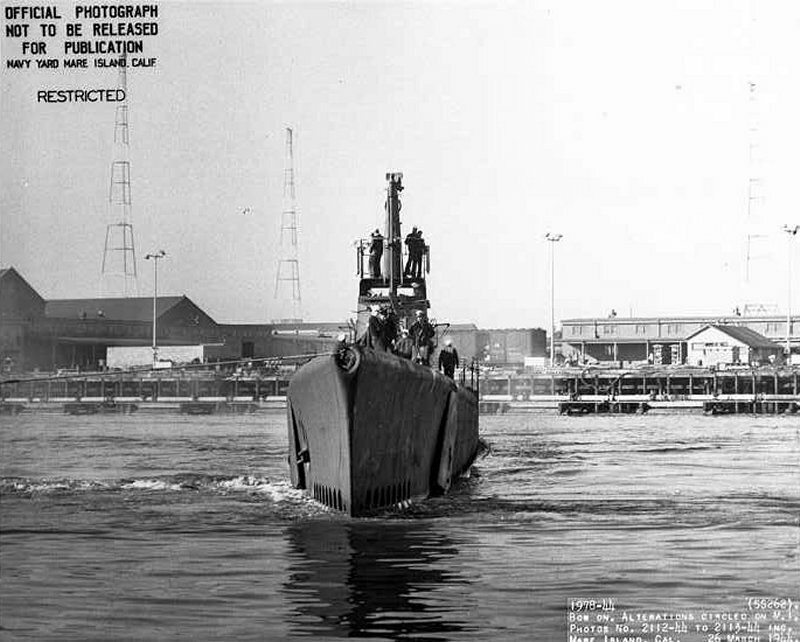 Mare Island cut down the fairwater and used welding instead of rivets. Official USN photo courtesy of George & Linda Salava. This photo was from the collection of FC3 Frank Salava who was K.I.A. 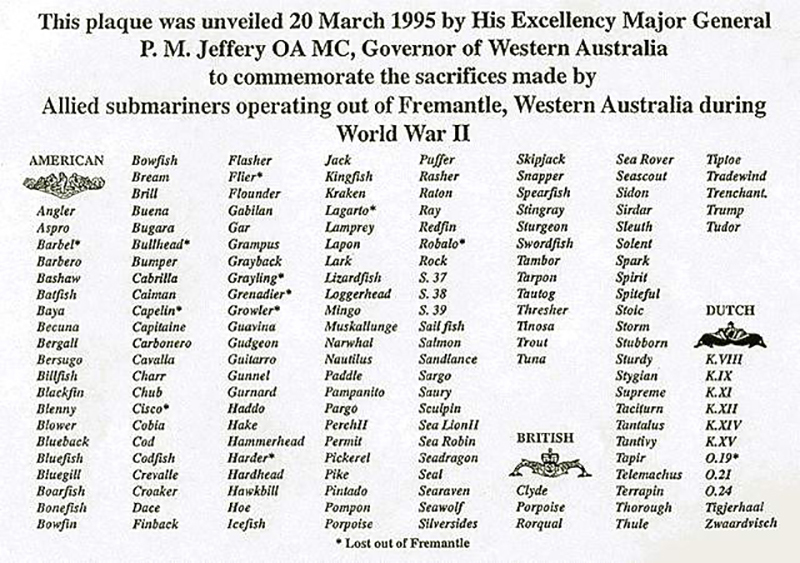 when the Sculpin (SS-191) was sunk & 62 other crewmen were K.I.A. on 19 November 1943. Text i.d. courtesy of John Hummel & John Hart. 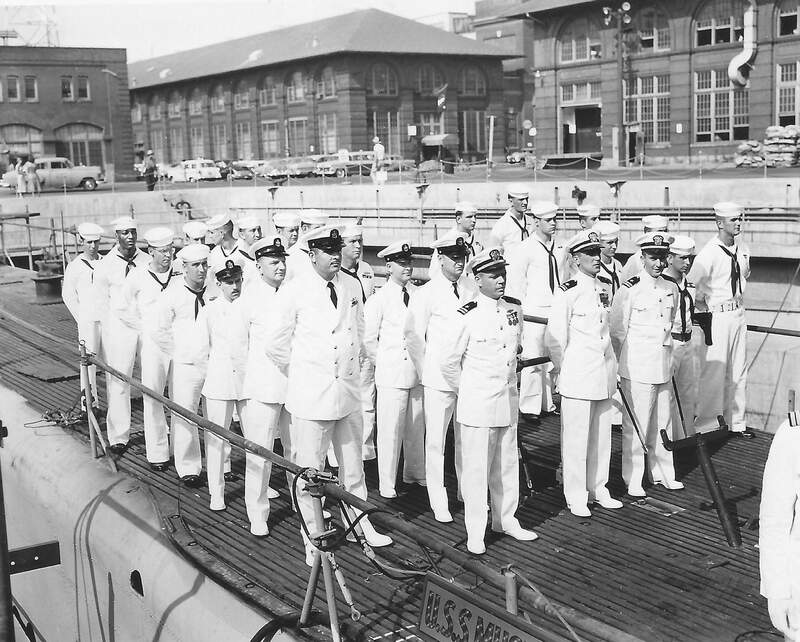 193k As the strains of "Anchors Aweigh" are played out on the boat's stern, the Officers and crew of the Muskallunge (SS-262) stand at attention & salute the raising of the National Ensign during her commissioning, on 15 March 1943, Lt. Comdr. 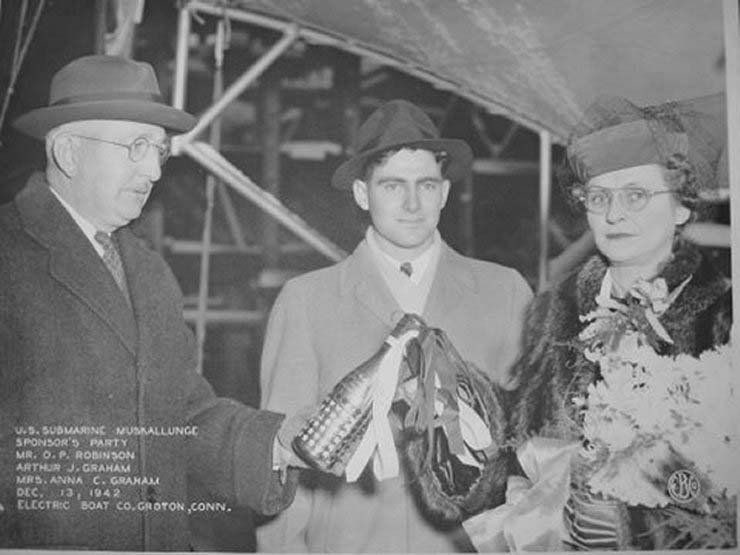 Willard A. Saunders, her commanding officer, is on the extreme left. Official USN photo courtesy of George & Linda Salava. This photo was from the collection of FC3 Frank Salava who was K.I.A. when the Sculpin (SS-191) was sunk 19 November 1943. 251k Lt. Cmdr. 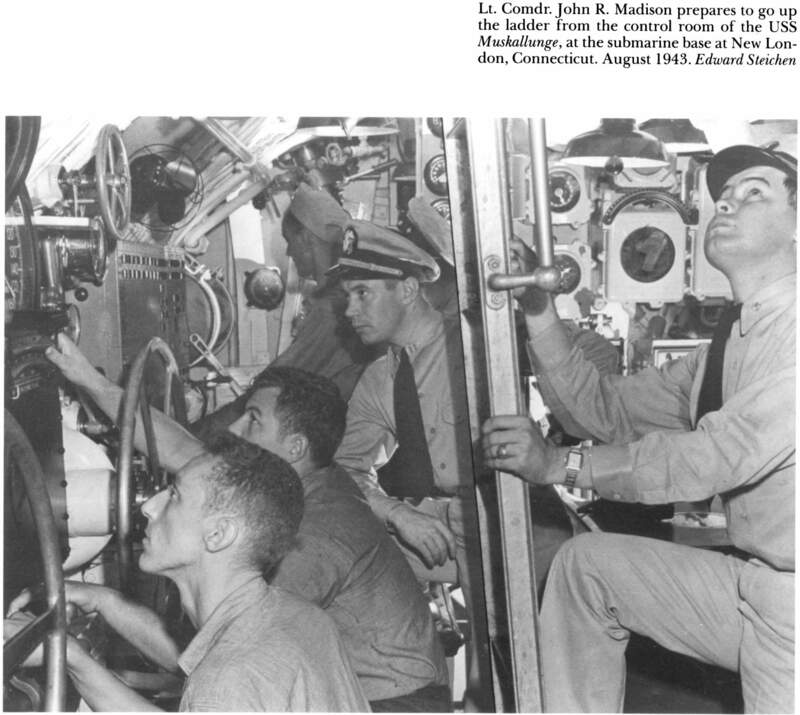 John R. Madison prepares to go up the ladder from the control room of the Muskallunge (SS-262) at the submarine base at New London, CT., August 1943. USN photo by Cmdr. Edward Steichen, courtesy of Scott Koen & ussnewyork.com. 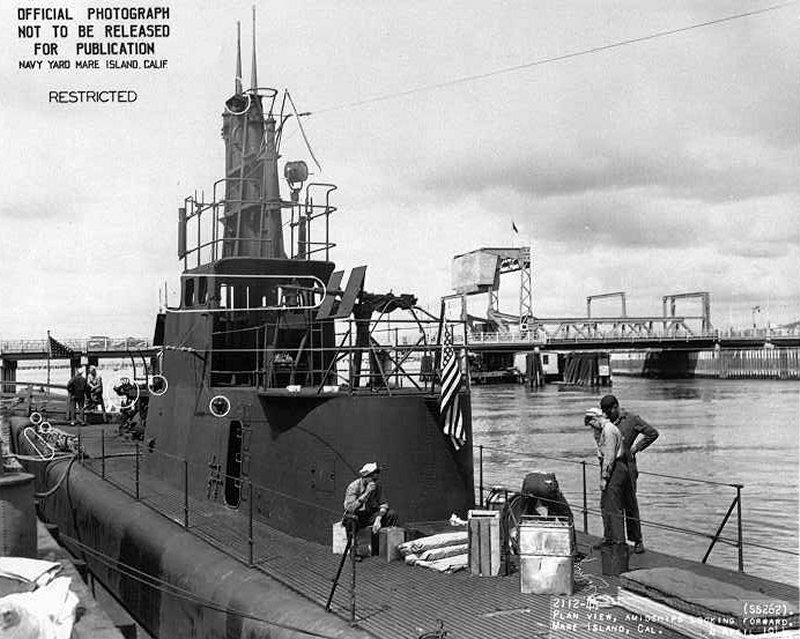 148k Port side view of the Muskallunge (SS-262) underway off Pearl Harbor 4 September 1943. She cleared Pearl Harbor 7 September for her first war patrol, taking station off the Palau Islands. Muskallunge carried the first electric torpedoes to be fired in the war by an American submarine. USN photo from NARA # 80-G-276699, courtesy of Daniel Dunham. 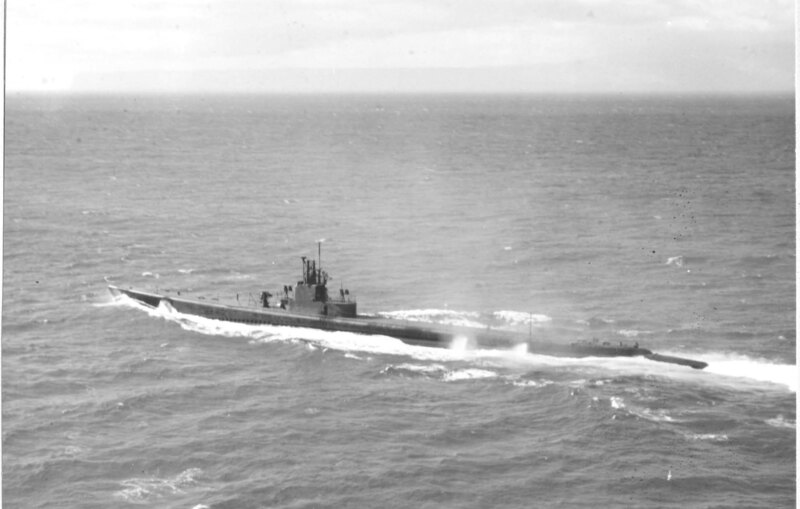 202k Muskallunge (SS-262) starboard view underway, 4 September 1943. USN photo from NARA # 80-G-276700, courtesy of Daniel Dunham. 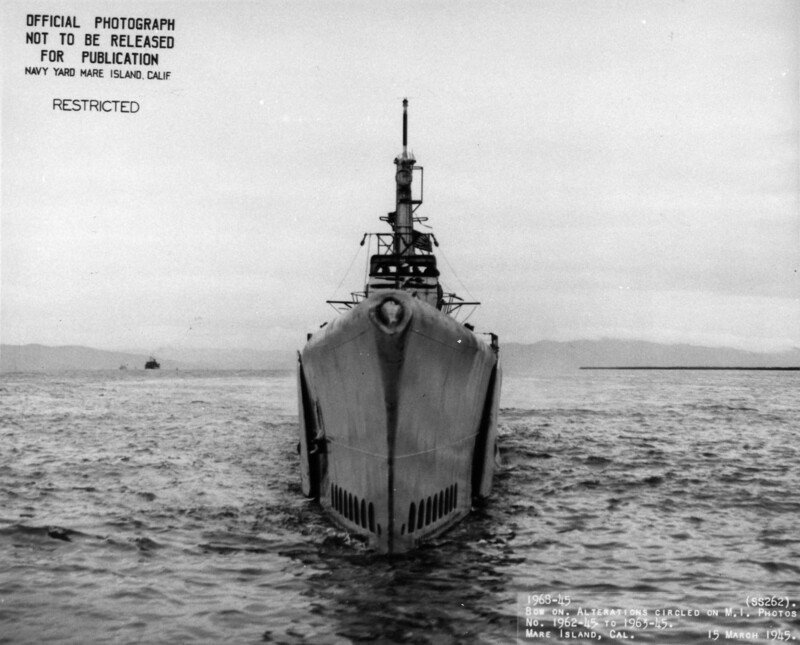 311k Stern view of Ray (SS-271) departing Mare Island on 9 March 1945. Muskallunge (SS-262) can be seen forward of Ray. USN photo # 1737-45, courtesy of Darryl L. Baker. 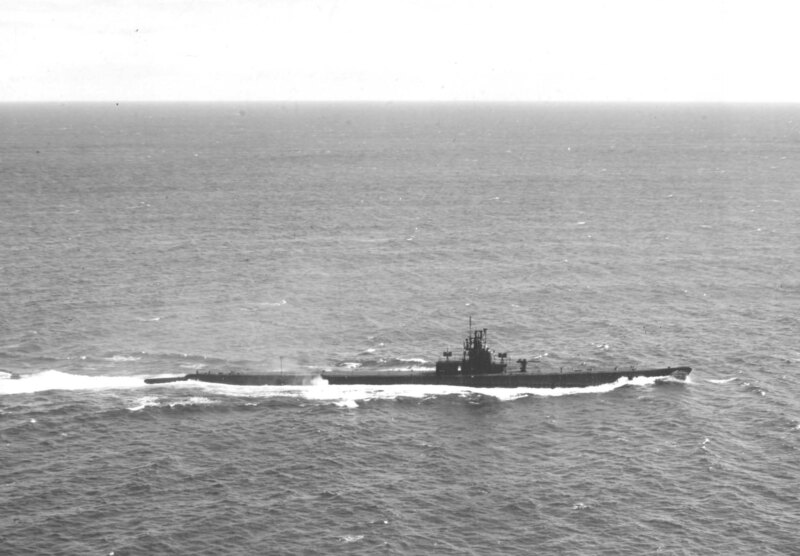 261k Stern view of Muskallunge (SS-262) off Mare Island on 15 March 1945. The Carquinez bridge is in the background. USN photo # 1964-45, courtesy of Darryl L. Baker. 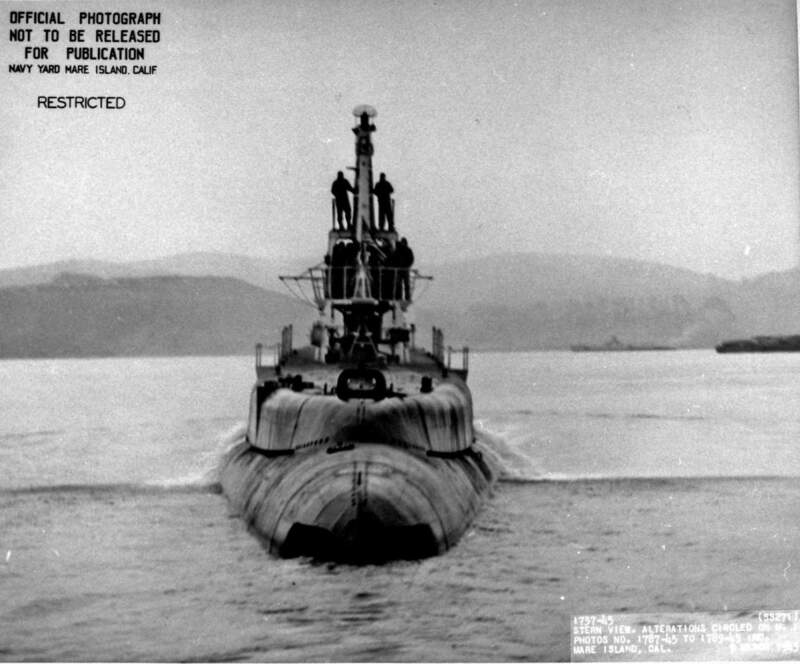 252k Bow on view of Muskallunge (SS-262) off Mare Island on 15 March 1945. USN photo # 1968-45, courtesy of Darryl L. Baker. 378k Port side view of the Muskallunge (SS-262) at Mare Island following a refit, 26 March 1944. USN photo # 1981-44, courtesy of Darryl L. Baker. 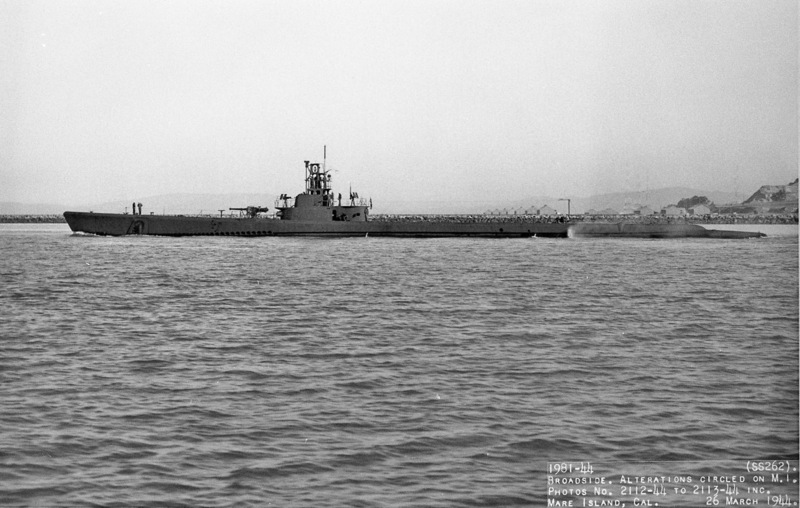 91k Bow on view of the Muskallunge (SS-262) at Mare Island following a refit, 26 March 1944. USN photo courtesy of ussubvetsofwwii.org. 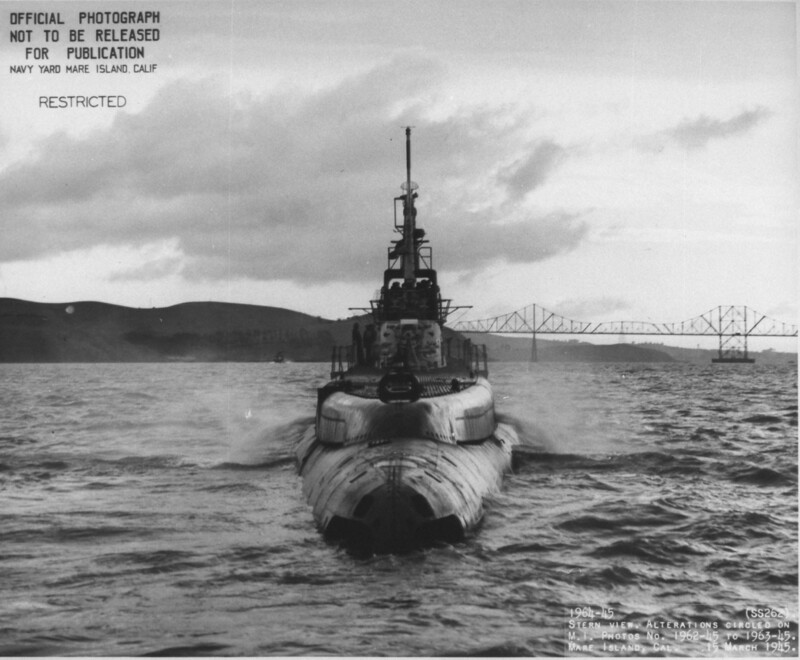 102k Stern view of the Muskallunge (SS-262) at Mare Island following a refit, 26 March 1944. USN photo courtesy of ussubvetsofwwii.org. 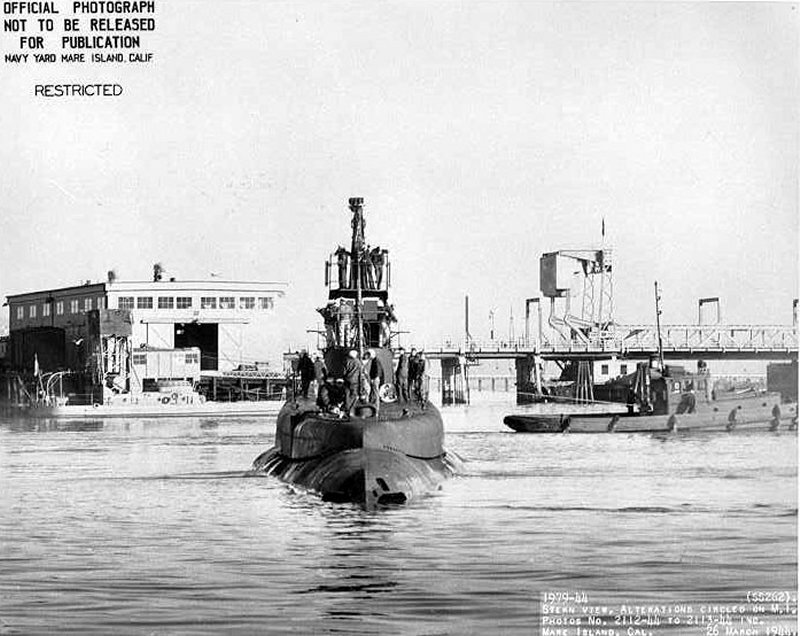 114k General plan view of the Muskallunge (SS-262) at Mare Island following a refit, 26 March 1944. USN photo courtesy of ussubvetsofwwii.org. 202k Muskallunge (SS-262) starboard view, March 1945. Courtesy of The Floating Drydock, Fleet Subs of WW II, by Thomas F. Walkowiak. 560k Three page PDF of Muskallunge's (SS-262) WW II history. USN photos courtesy of ussnewyork.com. 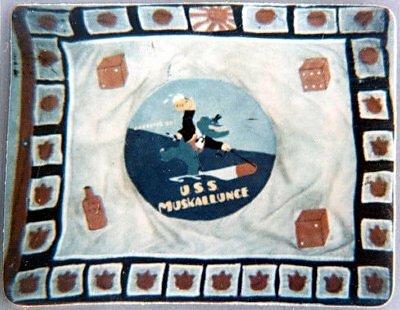 37k Muskallunge's WWII battle flag. USN photo courtesy of ussubvetsofwwii.org. 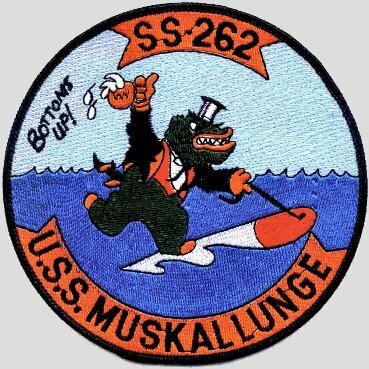 390k Muskallunge's (SS-262) recommissioned 31 August 1956 prior to transfer to Brazil. The contributor's father, Hubert H. Hawkins, Jr, is the enlisted man showing between the tall chief in front and the short chief to his left. Photo courtesy of Larry Hawkins. 56k Humanita (S-14) in foreground & ex-Paddle (SS-263), now the Brazilian Riachuelo (S-15) operating together, circa 1959-60. Brazilian Navy photo courtesy of Jane's Fighting Ships" 1959-1960. Photo submitted by Robert Hurst. 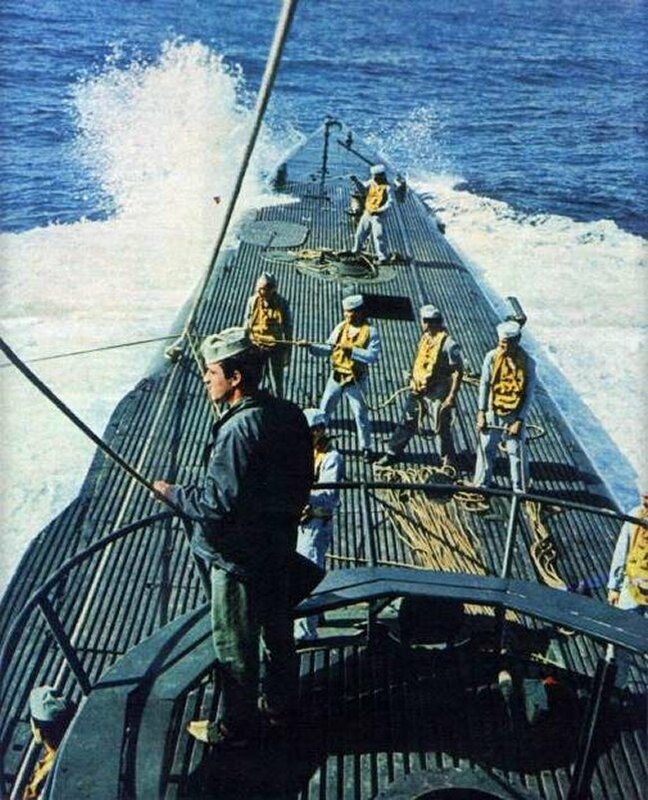 62k ex Muskallunge (SS-262) as the Brazilan Humanita (S-14), off the coast of Brazil, October 1966 about to transfer supplies to the ex-Plaice (SS-390), Brazilian Bahia (S-12). Brazilian Navy photo by Revista O Cruzeiro, courtesy of naviosdeguerrabrasileiros.hpg.ig.com.br. Photo submitted by Valdo Novaes. 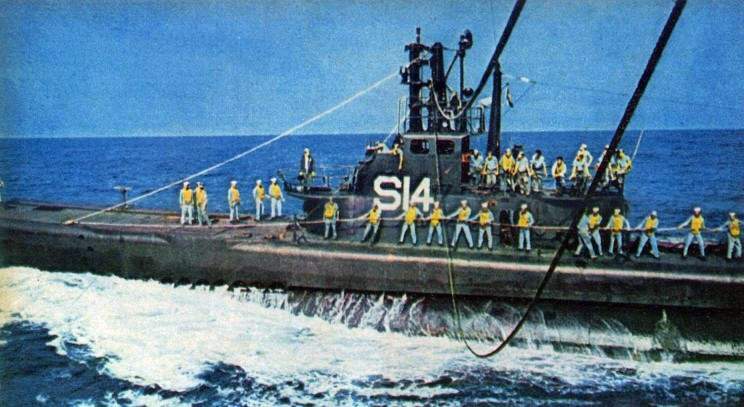 54k ex Muskallunge (SS-262) as the Brazilan Humanita (S-14), off the coast of Brazil, October 1966 transferring cargo to the ex-Plaice (SS-390), Brazilian Bahia (S-12). Brazilian Navy photo by Revista O Cruzeiro, courtesy of naviosdeguerrabrasileiros.hpg.ig.com.br. 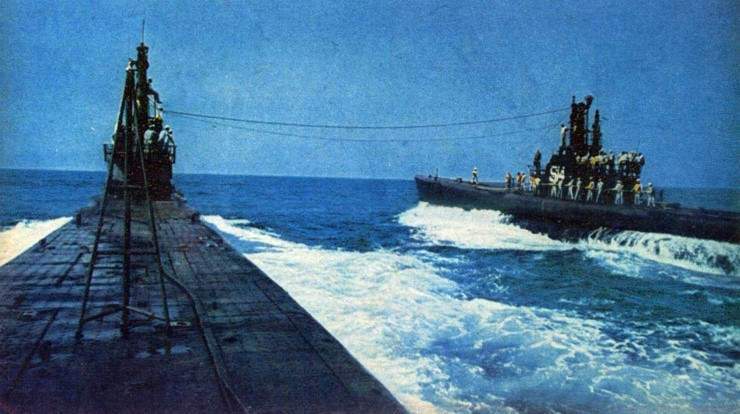 48k ex Muskallunge (SS-262) as the Brazilan Humanita (S-14), port side, off the coast of Brazil, October 1966 transferring cargo to the ex-Plaice (SS-390), Brazilian Bahia (S-12). Brazilian Navy photo by Revista O Cruzeiro, courtesy of naviosdeguerrabrasileiros.hpg.ig.com.br.